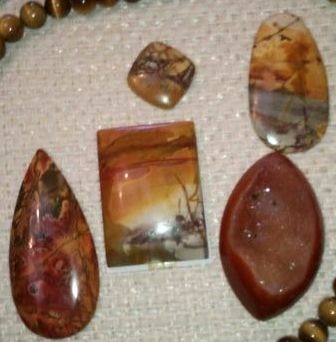 When I attended the Tucson Gem show in February, I found some gorgeous examples of Red Creek Jasper. 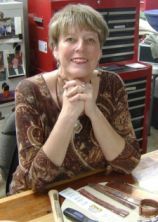 An article about this newest mine find was published in the December 2010 issue of Jewelry Artist Magazine. I was so intrigued by this new jasper. Red Creek Jasper was named after a stream that runs through the area in northwestern China where the deposit was discovered. The stone comes in hues of red, green and black. It has similar qualities to picture jasper in that one can visualize landscape images in the stone. I have just started working with the stones I purchased and this pendant to the right is the first piece available on my site. The actual FIRST piece became part of my personal collection. After all…What’s the fun in being a jewelry artist if you cannot create gems for yourself??? Here are more of the stones that I purchased in February. Actually this is just a sampling. I went a little crazy and purchased about 4 times what you see here! Jasper is considered an emotionally calming stone.. It sure has that effect on me! Red Jasper additionally is considered a healing stone, drawing our focus away from pain and back to our calm center. Look for more designs using this gemstone. I continues to excite me each time I take out my gems to determine the next piece to work with. My designs are available for purchase at Alene’s Adornments. We started carrying this stone when it first hit the market. The factory called it “Brazil Wild Horse Jasper,” but we’ve since discovered that the proper name is Red Creek Jasper. This stone is most commonly mined near the Red River in China. This stone seems to have a lot of names: Cherry Creek Jasper, Red Creek Jasper, Red River Jasper and New Picasso Jasper (to distinguish it from the original Picasso jasper found in Utah). And from what I understand, it’s not even a jasper! But it sure is pretty and inexpensive. thanks for your comments. Red Creek Jasper is the way it was presented to me. I first saw information on it in one of the trade magazines and fell in love with it. This stone is from China but I am sure there are so many similar varieties. Is it Jasper?? who knows? The price range is moderate, making it attractive to work with as well!